Emma has been riding at Lancers for just over a year now and is in our J1 Tuesday evening ride. She had plenty of riding experience and fits so well into our J-ride program. Emma is currently studying at Dalhousie so it is convenient for her to ride with us and she enjoys that Lancers provides a great stress relief from school. Emma started riding at the age of six at Eve Mainwaring's St. Albans Stables in Brockville, Ontario and began showing on the local Trillium circuit. When her trainer thought it was time to take it up a notch, she began showing on the Quebec and Ontario A circuits. In 2011, she qualified for the Royal Winter Fair. She continued to show on the A circuit in the jumper ring with her young horse who she had been working with for three years. When she decided to come to Halifax to attend Dalhousie, she had to make the hard decision to put riding on hold for the time being. Riding at Lancers, even if just once a week, keeps her in the saddle. Emma says that Baloo is her new favourite Lancer horse for certain. She particularly likes his sweet and curious personality. Baloo came to us a few months ago and we have been working on making him more of a school horse so it has been valuable to have Emma work with him. She has been riding him almost every week for the past couple of months and says it is “great to see how he’s coming along”. Over the past year, while balancing her studies, Emma has volunteered to do Saturday night hay. She enjoys evening visits because the stables are so quiet! 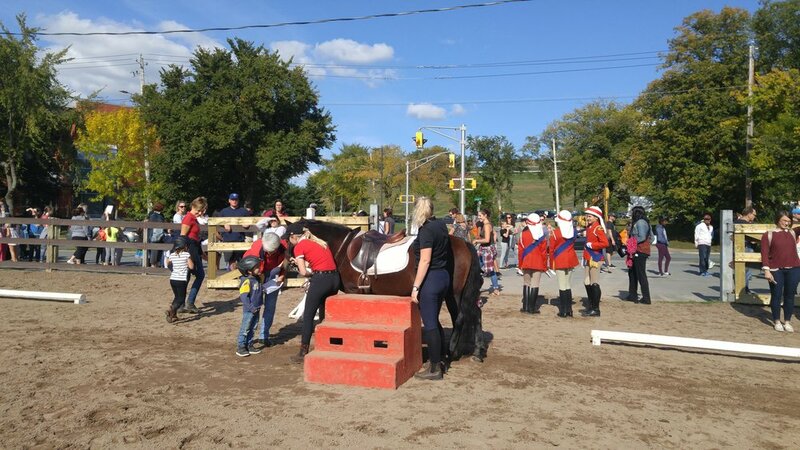 In October, Emma also helped out at our Open House by leading pony rides. She thought it was a great event that gave the city a chance to check out the barn and interact with the horses. There were certainly lots of smiling children on those horses she was leading! Emma is currently resting up from a concussion (not riding related!) but we hope she will be back in the saddle soon enough. Then, in her future, she hopes to someday be back on the show circuit and working in her field of study (political science and security studies). Emma also likes spending time outdoors and on the water so it seems that being in Halifax for university is a fitting choice!